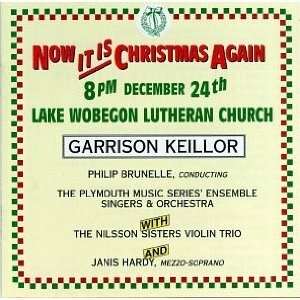 The peculiar charm of Garrison Keillor and the Lake Woebegone mystique does not fully explain the charm of this album called "Now it is Christmas Again". I love this CD! It just gives you that warm Christmas feeling every time you listen to it -- old fashioned and unhurried. It makes a great gift for yourself or that person who has everything (you know the type). His other Christmas CD (under books) is alright, but this is the one to buy. I wish it was easier to find on here though -- it took me a few tries because of the /Garrison Keillor at the end , and his CD's and tapes being put into all different categories. Funny at times, reflective at times, this is my favorite Christmas album! The stories are great and the music is of excellent quality. While many songs are in their native language, I love how the "old world" meets "sensible midwestern world." Having lived in Alaska for many years, christmas would not have been the same without listening to public radio broadcasting Keillor and his band of merrymakers. It made the long winter nights a little more bearable. Now living in the lower 48, it just makes it feel a little more like home with the companion gang during the holidays.